There’s little doubt that the summer season is regarded by most as the best time of the year to play in the water. However with jet-skis, power boats, and water skiers churning the lakes into a froth, weekend and holiday fishing can be frustrating and almost fruitless. A person could just fish on the week days and avoid the weekends altogether, but for many of us the weekends are about our only days to fish. Some years back my Father taught me that meaningful success doesn’t come from waiting for perfect conditions, it comes from making the best use of the conditions at hand. If you’re like me, when it’s your day to fish, than you’re going to fish, regardless of boat traffic, we’re gonna give it a try. I have found that on most lakes, even when watercraft activity is the highest, there are usually areas that most boats won’t go. It may be due to rocks, weeds, or shallow water, but whatever the reason, these pockets of water are left alone, and not just by pleasure boaters, but often by anglers as well. I have found that when activity on the main area of the lake becomes crazy, often taking advantage of one of these secluded spots can produce a few fish and turn frustration into fun. One such area that has become a favorite of mine and that can be found on most lakes is a stretch of water that I call the margin. When you observe a lake you’ll often notice stretches of tall weeds along some of the shoreline. In almost all cases these weeds don’t begin until some twenty feet or so from the shore, usually due to depth of water. The small area of water located between the shore and where the tall weeds start is the stretch of water that I refer to as the margin. The margin water is seldom more than waist deep and can be fished from a canoe or small boat, but because of tight conditions I feel that I have my best results wade-fishing these areas. 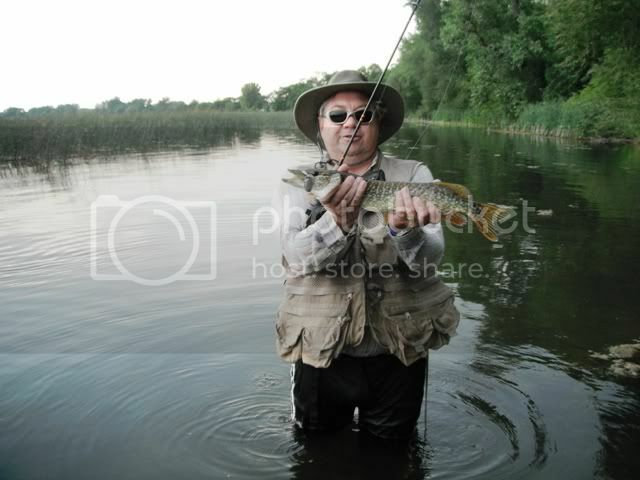 Although once in a while you may hook up with a large Bass or Pike, for the most part the catch will consist of tiny pan-fish to fair sized Crappie, Sunnys and Perch. Fly and spinning gear are my choice of tackle to use in this water. Because the shallow water can become much hotter during a bright summer day, I look for a shoreline with trees, shade and some structure. On most of my favorite lakes I have found these conditions located on the northern shore. This particular outing, my Son-in-law had taking me out to a fair sized lake located northeast of the Twin Cities. It was late afternoon, a bright sunny day with temperature near 100. The shallow water felt as hot as bath-water and over all the water was congested with large clumps of slimy moss that came up to the surface or ended just a few inches below it. I started out casting spinners into the small areas that were without moss, than making my retrieve back between and around the various clumps of moss as best as I could. At first the action was slow to almost non-existent, than I found that by greatly increasing the speed of my retrieve to almost buzzing the spinner across the top of the water, the action picked up and I started to get hits. It seems that in this hot water the fish wanted something fast to chase. While most of the fish I caught were small to tiny pan fish, I did get to do battle with a few pike. One of these pike was as small as my finger and another had peculiar larger spot near his tail. All of the fish were caught on either the Golden Rainbow or Blue Super Bow single hook spinners. 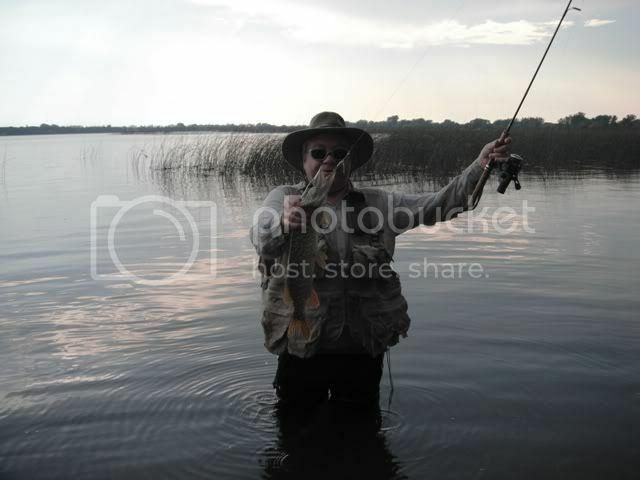 While this particular method of fishing won’t appeal to everyone, being able to fish in seclusion, hidden between reeds and shoreline alone with your thoughts while concentrating on making another cast, can be very relaxing. 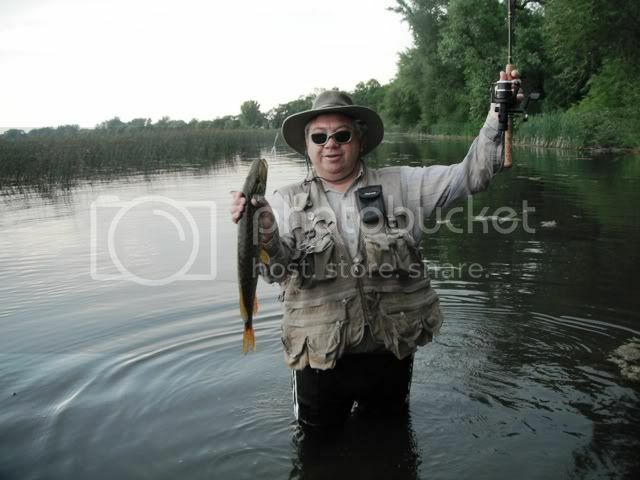 The margin water is also a great place to practice your Fly-Fishing skills. Keep it slow low and with the flow, and don’t go without your Bow.